Fast Setting Concrete is a pre-blended dry mixture of grey cement, sand, stone (aggregate) and special setting additives. It is used in situations where rapid setting of the concrete mis is required. Typical uses include setting of fence, pergola or clothesline posts and handyman concrete. Simply place mixture in hole add water, mix well and the concrete mix will set in about 5-15minutes. Fast Setting Concrete should not be used for structural concrete purposes. Each 20kg bag of Fast Setting Concrete will yield about 0.01m3 of finished concrete; you will need about 100 bags for each 1m3 of concreting required. Fast Setting Concrete is a pre-blended dry mixture of grey cement, sand, stone (aggregate) and special setting additives. It is used in situations where rapid setting of the concrete mix is required. Typical uses include the setting of fence, pergola or clothesline posts, and handyman concrete. Place mixture in the hole, just add water, mix well and the concrete mix will set in about 5-15 minutes. Fast Setting Concrete should not be used for structural concrete purposes. Fast Setting Concrete is packed in 20kg bags. 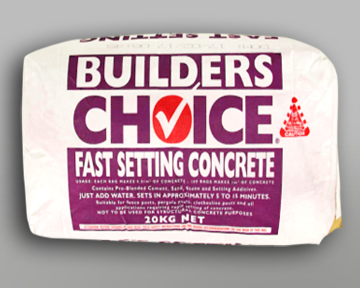 Each 20kg bag of Fast Setting Concrete will yield about 0.01m3 of finished concrete; i.e. you will need about 100 bags for each 1m3 of concrete required.